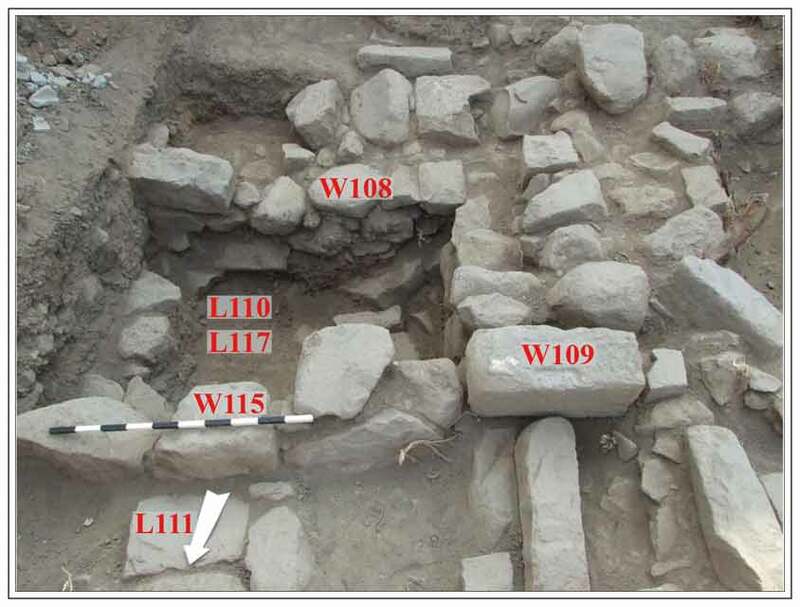 In October 2015, a small salvage excavation was carried out in a private building plot in et-Taiyibe (et-Taiyibe el-Zu‘abiya; Permit No. A-7519; map ref. 24215/72340; Fig. 1), following the exposure of ancient remains in a mechanically dug trail trench prior to construction. The excavation, on behalf of the Israel Antiquities Authority, was directed by Y. Alexandre (field photography), with the assistance of Y. Ya‘aqobi (administration), R. Mishayev and R. Liran (surveying and drawing), I. Delerzon (drafting), E.J. Stern (pottery consultation), H. Tahan-Rosen (pottery drawing), Y. Gorin-Rosen (glass), N. Marom (archaeozoology), I. Raznisky (metallurgical laboratory), R. Kool (numismatics) and C. Amit (studio photography). The village of et-Taiyibe is located near a spring on the western bank of Nahal Issaskhar, in the basaltic plateau of Ramat Issaskhar in eastern Lower Galilee. The remains of a fort built in the Crusader period are visible in the middle of the village. The fort was identified as Forbelet, one of the smaller forts built to protect the western approach to the major Crusader fortress of Belvoir (Kokhav Ha-Yarden), which controlled the central Jordan valley (Abel 1937). In the Mamluk period, the fort, now called ‘Afrabala, continued to be occupied. Two archaeological sites are known within the village precincts: Horbat Haddad, east of Nahal Issaskhar and Khirbat et-Taiyiba to its west. 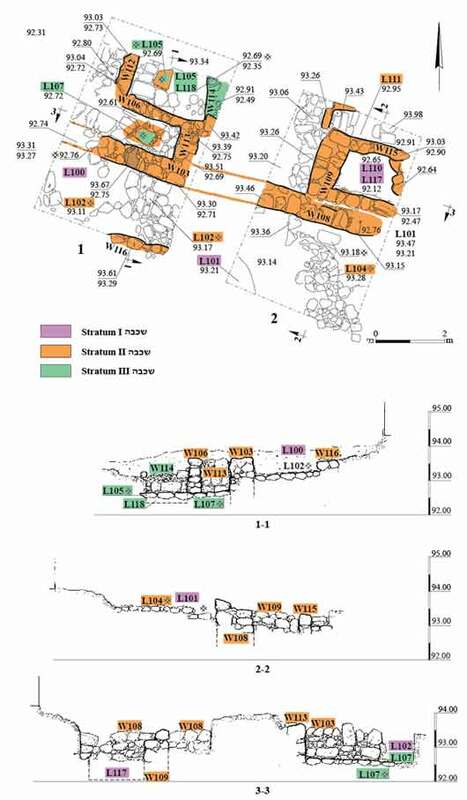 Previous surveys in the village have documented ancient remains and pottery from the Early Bronze, Roman, Byzantine, Crusader and Mamluk periods (Guérin 1880:268–269; Tsori 1977:90; Gal 1991: Sites 53, 54; Tepper 2012). 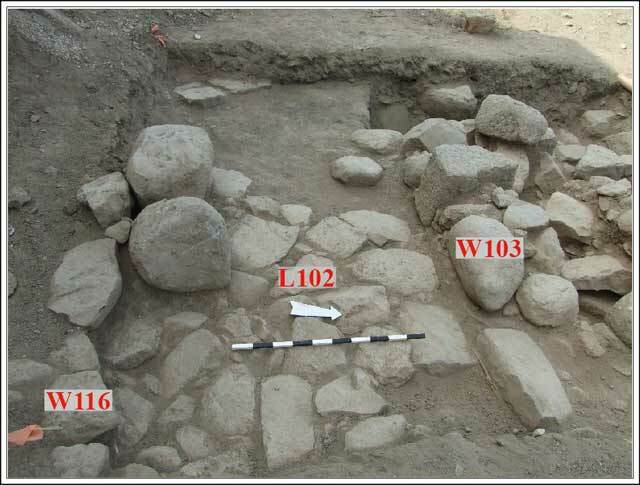 Excavations at the village have exposed architectural remains, installations and pottery dating from the Hellenistic to the Ottoman periods (Abu Zidan 2011 [Fig. 1: A-5179]; Tepper and Covello-Paran 2012 [Fig. 1: A-3546]; Atrash 2015 [Fig. 1: A-4622]; Dalali-Amos 2016 [Fig. 1: A-7028]). The present excavation (Sqs 1, 2; c. 50 sq m; Fig. 2) exposed limited remains of a building, probably dating from the late Byzantine and Early Islamic periods (Stratum III;seventh–ninth centuries CE), overlain and reused by a building that was attributed to the Mamluk–Ottoman periods (Stratum II; fifteenth–eighteenth centuries CE); all the stones employed in the buildings were local basalt stones. Subsequent activity in the later Ottoman and modern periods (Stratum I; nineteenth–twentieth centuries CE) damaged the earlier remains. A broken basalt loaf-shaped grinding stone found in secondary use in the Stratum II building was the only indication of pre-Byzantine activity in the area. Several pottery sherds from the twelfth century CE reflect a presence during the Crusader period. The excavation did not reach bedrock or virgin soil, as this would have involved the removal of the Stratum II building remains. The evidence from this excavation as well as from previous ones support the hypothesis that the present-day village grew around the Crusader–Mamluk-periods fort. Stratum III (late Byzantine–Early Islamic Periods). 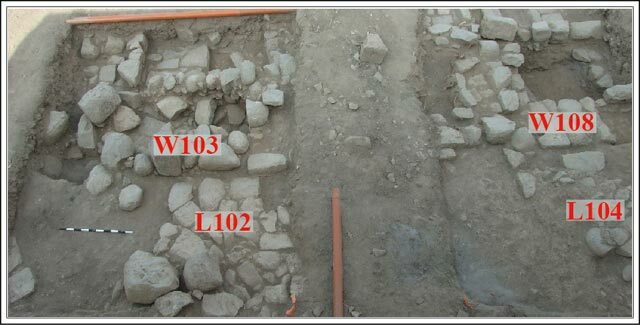 A short segment of a stone wall (W114) and a partially preserved, carefully paved stone-slab floor (L105, L107) were attributed to Stratum III (Fig. 3). 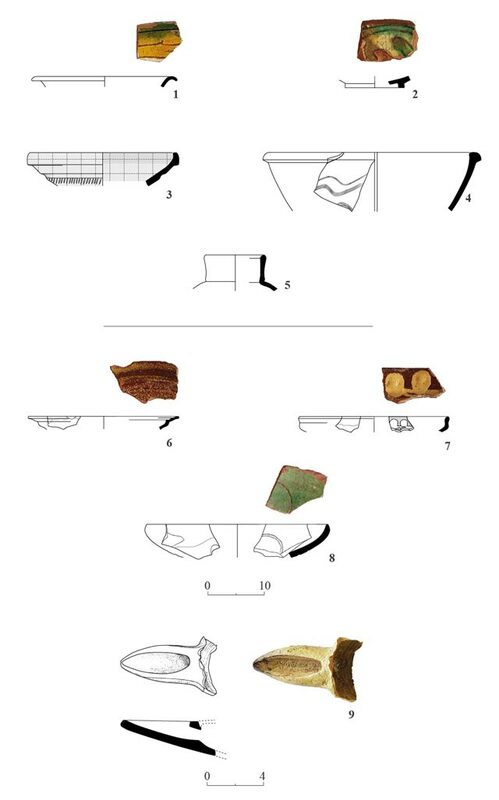 Several Byzantine-period body sherds (not illustrated) were found within the packed earth between the floor slabs and below two of them (L118; Fig. 2: Section 1–1). Several Early Islamic sherds found on the floor and in the mixed, overlying accumulations covering it probably belong to the occupation phase of the Stratum III building. Stratum II (Mamluk–Ottoman Periods). Several small rooms of a single building were attributed to Stratum II. They were delimited by short, adjoining walls (W103, W106, W108, W109, W112, W113, W115, W116), extant two to four courses high. The walls were carelessly constructed of a mixture of worked stones and field stones of various widths (see Fig. 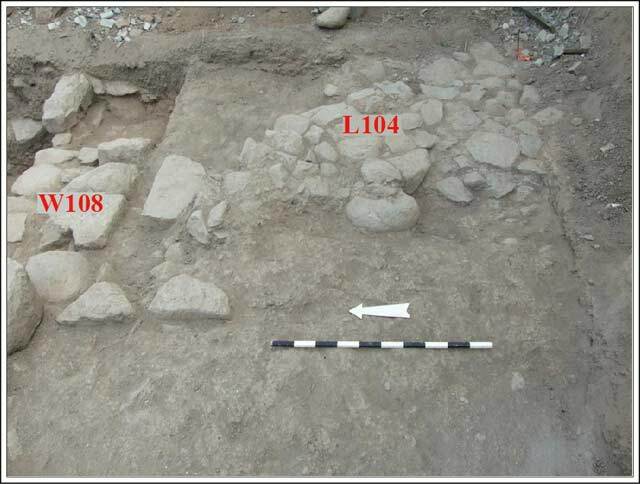 3), suggesting that the builders reused building stones, probably from the earlier, Stratum III building. Collapsed stones from the walls were discovered inside the rooms. Walls 103 and 108 (Fig. 4) make up a long wall that traverses the entire excavation area and was probably part of the external southern wall of the building; incorporated within it is a large, upstanding doorpost stone (Sq 1). 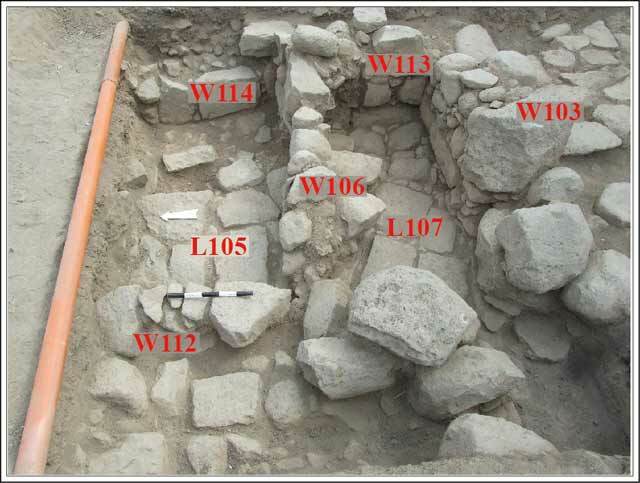 Walls 103, 106, 112 and 113 (Sq 1) were builtdirectly over the Stratum III stone-slab floor (L105, L107), reusing it as the floor of the Stratum II building (Fig. 5). 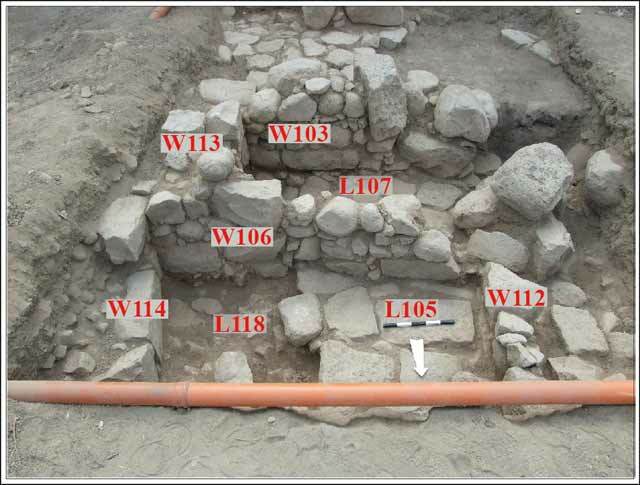 Walls 108, 109 and 115 (Sq 2) were exposed below a large stone collapse. Several stone slabs revealed in this square (L111; Fig. 6) are probably the continuation of the stone-paved floor unearthed in Sq 1, here for the most part cut through by a later pit (L110, L117). Several layers of a powdery basaltic accumulation were revealed inside the Stratum II rooms, above the stone-paved floor and below the stone collapse. This accumulation contained pottery, dated mostly to the Mamluk period, with some Ottoman-period sherds, many animal bones, several glass fragments, a bronze kohl stick and a worn coin. A partly preserved paved floor (L102, L104), made of large, carefully laid basalt slabs, abuts the southern face of W103/108 (Figs. 7, 8)—probably a paved courtyard or a pathway. A short wall segment (W116) discovered in the southern part of Sq 1 seems to have delimited the floor on the south. This floor is 0.5 m higher than the stone-paved floor inside the building (L105, L107), indicating that the construction in this part of the site may have been terraced to accommodate the topography. A large sherd belonging to a globular cooking pot, found surrounded by a concentration of ash in the southwestern corner of Sq 2 (L101), may belong to Stratum II. Stratum I (The Ottoman–Modern Periods). The small space between Walls 108, 109 and 115 contained debris (L110, L117; see Fig. 6) with pottery sherds of various periods, indicating the Ottoman period; it probably served as a refuse pit after the Stratum II building fell out of use. The retrieved pottery comprised small Byzantine body sherds (not illustrated), several Early Islamic sherds of the Umayyad and Abbasid periods, several Crusader-period sherds and mostly Mamluk and Ottoman sherds. Since there were no loci with uncontaminated assemblages, the pottery is presented typologically according to period, with limited parallels. Early Islamic Period (Fig. 9:1–5). The pottery includes two polychrome Splash-Ware bowls—one of glazed cream-ware with an S-profile rim (Fig. 9:1) and the other of glazed pinkish ware (Fig. 9:2)—with parallels from Tiberias dated to the tenth and eleventh centuries CE (Stacey 2004:117–118); an Egyptian Red Slip ‘A’ bowl with brown paint on the rim (Fig. 9:3) from the eighth century CE (Stacey 1988–1989: Fig. 2:5, 6); and a large gray basin or krater with an incised decoration of multiple wavy lines (Fig. 9:4) and a dark gray-brown, gritty-ware storage jar with a plain neck and a plain rim (Fig. 9:5), which are characteristic of the ninth–tenth centuries CE (Stacey 2004:97, 126). Crusader Period (Fig. 9:6–9). The pottery includes a couple of Beirut Glazed Bowls with red gritty ware and brown and cream glaze (Fig. 9:6, 7), dated in Akko to the twelfth–thirteenth centuries CE (Stern 2012: Pt. 1:44–47, Pt. 2: Pl. 4.19, Type BE.GL.2); one incised coarse Aegean bowl with a light green glaze on the interior (Fig. 9:8), also dating from the twelfth–thirteenth centuries CE (Stern 2012: Pt. 1:65–69, Pt. 2: Pl. 4.49, Type GR.GL.6); and a North Syrian Glazed Ware lamp nozzle made of cream ware with a translucent light green glaze (Fig. 9:9) from the thirteenth century CE (Stern 2012: Pt. 1:55–58, Pt. 2: Pl. 4.31:14, Type NSY.GL.1). Mamluk Period (Fig. 10:1–8). The pottery includes a green Monochrome Glazed Bowl (Fig. 10:1; Avissar and Stern 2005:14–15, Type I.1.4.2) and a green and yellow glazed bowl with sgraffito decoration (Fig. 10:2; Avissar and Stern 2005:16, Type I.1.5), both dating from the fourteenth–fifteenth centuries CE; a single Soft-Paste Ware bowl painted in black and blue (Fig. 10:3; Avissar and Stern 2005:26–31, Type I.2.3.1); a bowl made of coarse ware with a burnished, red-slipped interior continuing over the rim (Fig. 10:4); a large basin with a thickened rim protruding on the inside and outside (Fig. 10:5), which dates from the thirteenth–fifteenth centuries CE (Avissar and Stern 2005:84, Fig. 36:5, Type II.I.2); a frying pan with light-brown glaze and a gutter rim (Fig. 10:6; Avissar and Stern 2005:97, Type II.2.3.5); a globular cooking pot (Fig. 10:7; Avissar and Stern 2005:92, Type II.2.1.5); and a handle belonging to a handmade jar with geometric painted decoration (Fig. 10:8; Avissar and Stern 2005:113–116, Type II.4.4). Ottoman Period (Fig. 10:9–14). The vessels attributed to the Ottoman period comprise a slip-painted bowl from Didymoteicho or the Dardanelles (Fig. 10:9; Vroom 2005:186–187); two globular cooking pots, a large pot with a high strap handle (Fig. 10:10) and a rim (Fig. 10:11), both exhibiting crushed quartz in the ware and a burnished surface characteristic of this period (e.g., at Yoqne‘am; Avissar 2005:66–67, Fig. 2.20:6, 7); black-ware jars (Fig. 10:12, 13), which were a common storage vessel at Nazareth in this period (Alexandre 2012:85–87, Fig. 3.19:7–12); and a burnished, dark red long shanked clay tobacco pipe (Fig. 10:14) found in the surface layer, which was classified at Yoqne‘am as Type 6, dated to the late nineteenth century CE (Avissar 2005:91–93). The excavation revealed several small glass fragments from the end of the Byzantine period and from the Crusader or Mamluk period, the latter made of colorless glass and decorated with blue glass threads; a broken basalt loaf-shaped grinding stone, found in secondary use in W103 of the Stratum II building; a small fragment of a white marble slab bearing a carved undulation, found in the debris of the Stratum II building; a broken bronze rod, possibly a kohl stick; several small iron fragments; and a single worn bronze coin, found in the surface debris and dated to the early Ottoman period (fifteenth–sixteenth centuries CE; IAA 161202). 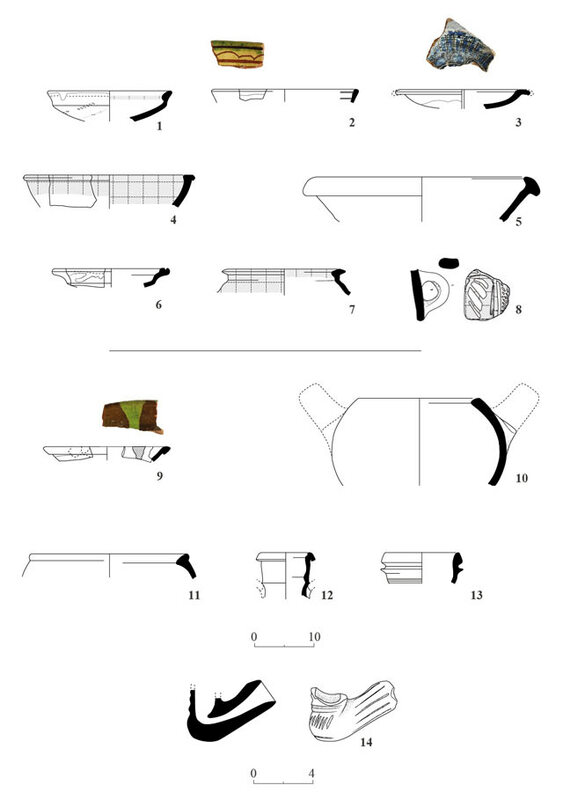 Forty-one identifiable mammal bones (Table 1) and one chicken bone were found in loci associated with the remains of the building (L101, L105, L107, L110, L111). The bones were identified and measured (Table 2) according to a standard protocol (Davis 1992), and compared to the osteological collection of the archeozoological laboratory at Haifa University. The identified species in the assemblage include sheep/goat (N=9; 22%; at least two individuals), cattle (N=17; 41.5%; at least two individuals), Equidae (N=9; 22%; at least two individuals), camel (N=2; 5%; at least one individual), dog (N=3; 7%; at least one individual), pig (N=1; 2.5%; mandible bone of a very young individual) and chicken (a single bone). The sheep/goat bones include three jaw bones of sheep that were slaughtered at an age younger than one year. Sheep/goats from most sites in Israel and from all periods were slaughtered somewhat later, at the age of two–three. The cattle bones are evidently slaughter refuse. Cattle was butchered at an older age—in their fifth or sixth year. Severe pathologies were detected in two of the cattle bones (first index and a metapodial bone), indicating that cattle served as beasts of burden. The Equidae remains include a small metapodial bone of a donkey and a complete metapodial bone of a horse (slenderness index = 16.0). One of the dog bones, a tibia (L101, B1005), is short and curved, suggesting that it belonged to a Pinscher. These dogs are not known from assemblages of the Mamluk and Ottoman periods, and it may be modern. The bones in the assemblage are rather complete; in 10 of the 17 long bones, the full perimeter of the bones was preserved, and several long bones were found complete. The bone breakage morphology of dry breaks indicates that most of them were naturally damaged in diagenetic processes that took place long after they were deposited; only two long bones—one belonging to a sheep/goat and the other identified as cattle—bear signs of cracking, suggesting that they were deliberately cracked open to extract the marrow. Four bones from the assemblage bear clear signs of gnawing by dogs. Knife cutting marks were noted on five bones, including a horse’s humerus and a camel’s tow bone. Five bones, including three belonging to Equidae, were affected by a prolonged deterioration processes that took place on the surface prior to being covered by soil. It seems that most of the assemblage represents slaughtering refuse and consumption of beasts of burden. Some of the refuse lay exposed for quite some time before it was finally covered by deposits. It seems that this refuse cannot be associated with the dwellers of the building uncovered in the excavation,but rather accumulated mostly in the building after it was abandoned. * The size of a Pinscher. Abel F.M.1937. Afrabala-Forbelet et L‘Ophra de Gedeon. JPOS 17:31–44. Abu Zidan F. 2011. Et-Taiyiba. HA-ESI 123. Atrash W. 2015. Et-Taiyiba. HA-ESI 127. Dalali-Amos E. 2016. Et-Taiyiba. HA-ESI 128. Gal Z. 1991. Map of Gazit (46) (Archaeological Survey of Israel). Jerusalem. Guérin V. 1880. Description géographique, historique et archéologique de la Palestine 3: Galilée II. Paris. Tepper Y. 2012. Et-Taiyiba, Survey. HA-ESI 124. Tepper Y. and Covello-Paran K. 2012. Et-Taiyiba. HA-ESI 124. Tzori N. 1977. 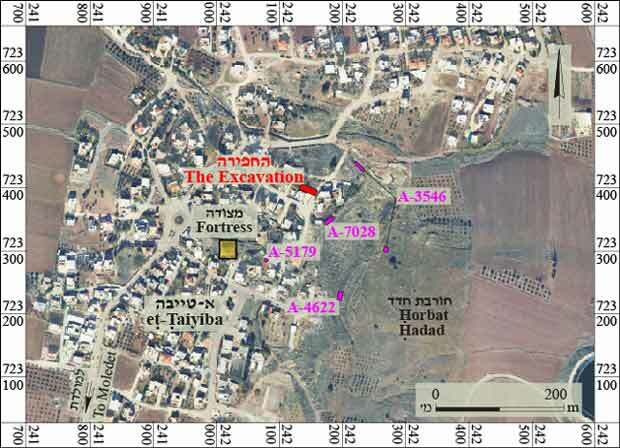 The Land of Issachar Archaeological Survey. Jerusalem (Hebrew). 3. Wall 114 and floor 105 (Stratum III), looking south. 4. Walls 103 and 108 (Stratum II), looking north. 5. Square 1 (Stratum II), looking east. 6. Square 2 (Stratum II), looking south. 7. Pavement 102 abuts W103 (Stratum II), looking west. 8. Pavement 104 abuts W108 (Stratum II), looking east. 9. Early Islamic (1–5) and Crusader (6–9) Pottery. 10. Mamluk (1–8) and Ottoman (9–14) Pottery.